UPDATE (MAR 31, 2011): It might seem remarkably apparent that this is a wee little board. The truth is… I can rarely dedicate myself to one project at a time, so I have about 7 boards on the go right now (at last count). They are stacked against the wall like some would-be artist’s canvases. I can’t afford the money/time/space to purchase a large board each time I have a new idea strike me down. I usually get a small board for keeping all the preliminary work on like this; that’s my laptop underneath it, if you need scale. 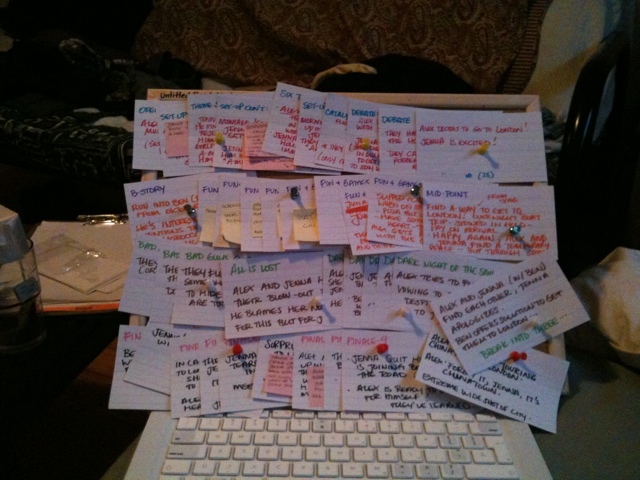 Once the project is in full-go, as in, once it is taking up the majority of my writing time (which won’t happen until pirates in space is done), then it can graduate onto a bigger board.